Evening desert safaris place you in direct contact with the mysterious beauty of the dusk. 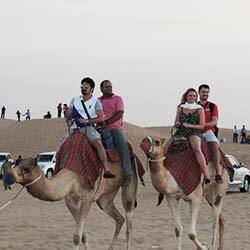 The main reason why many love the evening desert safari in Dubai is not only for its timing and it is a beauty of the sunset is a visionary whose explanation goes beyond words or vista. An evening drive through the golden sand dunes with the sunset as the backdrop, makes this a must experience at desert safari activity in Dubai. 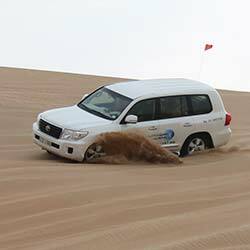 Depart for a thrilling drive over the sand dunes by 4WD-wheel drive “Dune Bashing”, deep into the heart of the desert. A photo halt for the fabulous view of the sun setting over the desert sand dunes are some of the memories you will cherish from the evening 4x4 desert safari in Dubai. You will arrive at the desert camp after a camel ride in Dubai, where a traditional Arabian welcome awaits you. Enjoy the beautiful Arabian ambiance at this typical Bedouin camp, with traditional tasseled Arabian carpets, low tables and cushions for comfortable seating at the desert camp experience with other activities henna painting on your hands and feet or simply enjoy the evening beneath the stars. You may also enjoy the aromatic Sheesha also known as “hookah”, followed by BBQ dinner - sumptuous barbecue meats, spiced and grilled right in front of you. The splendid dinner buffet will have a wide variety of barbecued delicacies and salads as your main course as well as dessert. 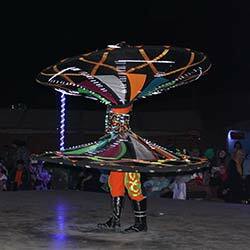 The climax of the evening is the live stunning performance shows under the star-lit sky by the exotic Belly dancer with amazing Tanoura dancer and breathtaking fire dancer. Journey to the Arab Dessert while you experience the exquisite landscape. Have a blast trying the sandboarding down the desert dunes. Live the true Arabic experience through desert photographic opportunities. Pick-up Timing: 15:00 - 15:30 (approximate time only, will change depending on the sunset). Good balance between the activities. Very good food. Nice sunset. However, take long pants and a warm sweater for the evening! Our driver was an amazingly friendly and caring person. The whole event was very well organized and the program and the food so much more, what we have accepted. There was pretty many different type of food and we were stuffed afterwards. I would recommend this experience to everyone! It was a really great experience to experience the sunset on a sand dune. The desert safari with a 4x4 over the sand was awesome and the sandboarding a very nice experience. 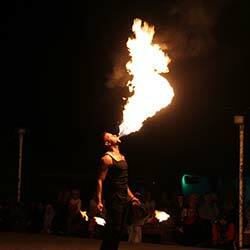 A perfect adventure day in the desert with a delicious barbecue and a belly dance show. You can only recommend to everyone. Awesome fun drive over the sand dunes! Loved the friendly camel and seeing the baby goats. Enjoyed the henna tattoo on my hand and dinner was excellent as was the belly dancer and whirling dervish show! Excellent tour! Super run, amazing experience in the desert and to see the nature! More than recommended! This tour offers exactly the same as the other and more expensive tours! It was a wonderful evening, everything went fine and the atmosphere of the excursion was the best. The driver was nice and took good care of us. The evening in the desert was a magical experience, a really great experience!